Above: Theresa May visits Wales to promote the Brexit deal struck with the EU on the weekend. Image (C) 10 Downing Street. The Prime Minister is facing a bruising defeat in the House of Commons when it votes on her Brexit deal in December as there are fears she might be unable to continue in her role in the event of a landslide defeat. We believe a change in leadership, alongside a sharp increase of 'no deal' Brexit risks would trigger a deep decline in Sterling in the short-term and bring to an end the relative stability we have seen over recent days. According to Tom Newton Dunn, Political Editor of the Sun, "Cabinet ministers are weighing up whether to urge the PM to abandon the meaningful vote on Brexit deal to avoid massive defeat by 200." "Theresa is still being told she can win this by the people around her in No10. It’s terrible advice and she deserves better, because they are going to bring her down," one cabinet minister tells Newton Dunn. This is a significant development as we feel foreign exchange analysts are not factoring in the importance of the scale of any defeat to the Brexit bill, and we believe it demands consideration. What is widely assumed by analysts, commentators and markets is that Theresa May's Brexit bill will lose its initial test of parliament. A narrow defeat could in fact be positive for the British Pound as it would signal to markets that May can almost certainly get the bill passed in a second outing, provided amendments are made. However, a sizeable 200+ defeat is almost irretrievable and as Newton Dunn argues, could deal "a fatal blow to her premiership." A defeat of this scale would also send a clear signal to Brussels that the offer they have made does not have the backing of the UK parliament, but Brussels have tied themselves to the current agreement and we struggle to see them being to offer the changes required to turn around a defeat of this scale. In short, a 'no deal' Brexit would almost be inevitable. Markets will find such an outcome incredibly uncomfortable and we believe this is a notable risk to consider ahead of year-end. "There remains a growing risk that the Withdrawal Agreement will not get through the House of Commons that would set the scene for a large depreciation of GBP/USD of 3.0% or more," says Joseph Capurso, a strategist with Commonwealth Bank of Australia. The Pound-to-Dollar exchange rate is quoted at 1.2750 on the inter-bank market, high-street banks are offering between 1.24 and 1.25, independents between 1.2630 and 1.2670. 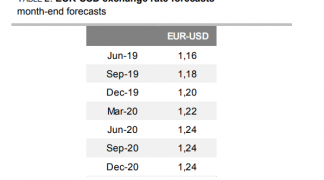 The Pound-to-Euro exchange rate is at 1.1286 on the inter-bank market, your bank is likely offering between 1.090 and 1.1090 for international payments, independents are likely offering between 1.1180 and 1.12. Media are meanwhile reporting May has backed down on efforts to prevent Parliament from changing the terms of the withdrawal agreement before the December 11 vote. It opens for a series of potential amendments to the motion; according to Elsa Lignos, a foreign exchange strategist with RBC Capital Markets, any amendments are unlikely to be tweaks on specific clauses of the withdrawal agreement, instead may be proposals like the 'Norway for now' idea, a second referendum or other alternatives. 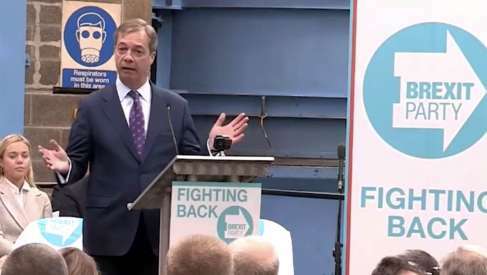 Bloomberg cites an anonymous UK official saying plans are private and parliamentary business managers from different parties are still working out details of how the vote will be held. "It’s hard to judge what it means for the chances of May’s agreement getting through Parliament with no amendments – one would argue lower than before – but govt officials claim there is no majority support for any of the alternatives. The ordering of votes on alternatives may make them each less likely in isolation – e.g. a second referendum is unlikely to get a majority if other options are still on the table," says Lignos. While a defeat on the scale of over 200 parliamentarians would be devastating to the Prime Minister, and the British Pound, May will almost certainly not back down. Midweek sees May will travel to Northern Ireland to discuss the Withdrawal Agreement and the Irish backstop issue with the Democratic Union Party (DUP). The Bank of England will be in focus later in the day when it publishes its analysis on the Brexit Withdrawal Agreement at 4:30pm GMT, a document that has been keenly awaited by politicians and economists alike. The Bank is likely to summarise its view on how May's Brexit plan is expected to affect the UK economy, relative to no-Brexit and no-deal scenarios. "What's not clear is if the BoE will discuss policy responses to the scenarios. 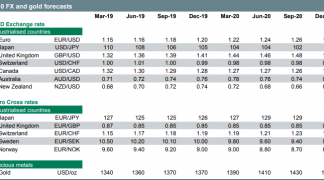 If they do, expect a no-deal scenario to emphasise uncertainty over policy direction, with a rate hike potentially on the cards, as the MPC has previously said," says a note from the currency desk at TD Securities. Alongside this publication, the Bank of England also releases its semi-annual Financial Stability Report and the results of the annual Stress Tests. A press conference follows at 4:45pm. The Treasury is also due to publish its own Brexit scenario analysis on Wednesday. 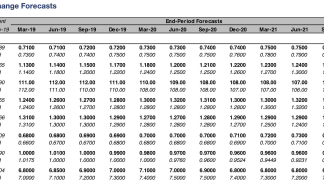 We see little sizeable impact on the British Pound stemming from these forecasts, however they must be viewed from the perspective of whether they support the Prime Minister's Brexit plan in the context of the above-mentioned parliamentary vote. If the answer is yes, as we believe will be the case, then the outlook for Sterling might brighten somewhat. However we don't see the Pound breaking out of its recent ranges against the Euro or U.S. Dollar for some time.